Happy birthday Antonio Frasconi (Elijah the Slave), Lois Duncan (I Know What You Did Last Summer, Hotel for Dogs), Ben Shecter (The Hating Book, Great-Uncle Alfred Forgets), Brett Harvey (My Prairie Year), Diane Hoh (Nightmare Hall series), Marvin Terban (In a Pickle: And Other Funny Idioms), Terry Pratchett (Nation), and Amy Hest (When Jessie Came Across the Sea). It’s the birth date of Palmer Cox (1840-1924), The Brownies, Barbara Juster Esbensen (1925-1996), Swing around the Sun. Best birthday wishes to Harper Lee (To Kill a Mockingbird). Read I Am Scout: The Biography of Harper Lee by Charles J. Shields. All month we have been celebrating National Poetry Month. As I mentioned in the essay on Firefly July, a large number of quality poetry picture books have started to appear over the last year or so. My mentor once told me that publishing trends are like sunspots—things come and go for no earthly reason. Well, that may be true, but the success of books by our author of the day, Joyce Sidman, has definitely helped make high-quality poetry picture books attractive for publishers. In a series of award-winning books, Joyce has found a way to make poetry both informative and accessible to readers. 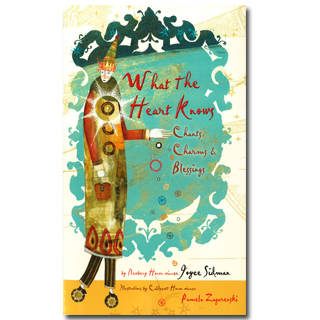 The book of the day, What the Heart Knows: Chants, Charms & Blessings, recently received a nod for the short list of the Los Angeles Times Book Award. That is just one of the many feathers in the cap of this talented author; she can boast both Newbery and Caldecott Honor Books. In this volume Joyce once again explores words and imagery tied to a nonfiction concept. Since the earliest times, humans have used words to try to change the world around them. So poems have been chanted to bring rain or sun, to win battles, or to keep evil away. Joyce has fashioned some modern-day chants—about repairing a friendship or facing loss—and placed each poem in one of four sections: chants and charms, spells and invocations, laments and remembrances, and praise songs and blessings. 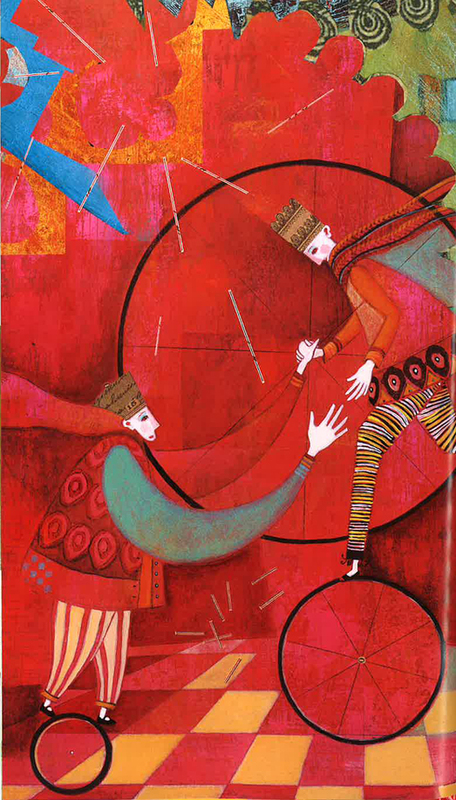 Designed as a small, vertical book, What the Heart Knows works best with readers older than the usual picture book audience, fifth graders and up. In the book, Joyce defines all the forms that she uses and then writes very powerful examples of each. In just a few well-chosen words, Joyce Sidman stirs a welter of emotion within the reader. Rather than a poetry month, we should really have a poetry year. What the Heart Knows can be used any day, at any time, to remind children of the power of language. take my hand; forgive the past. Anger’s brief, but love is vast. Take my hand; don’t think of leaving. Originally posted April 28, 2014. Updated for . I’m out to find this one and right now!